The Aditya Jyot Institute of Optometry team(unit of the Aditya Jyot Eye Hospital Pvt. Ltd) had organized a Human Chain on the occasion of the World Optometry Day – 23rd March 2008.Optometry is a Vision saving Primary Eye Care Profession.The Human Chain was organised to emphasize the theme for the year - Eye Donation. Dr. S. Natarajan (Chairman & Medical Director) was also present to grace this occasion.This event began at 8.30 am from Hospital. The participants were mainly the student task force of Aditya Jyot Institute of Optometry along with the Academic Head (Dr.N.S.Sundaram). A few pedestrians, willingly obliged to participate for this noble cause.Eye Donation pledge cards were distributed at different junctions around the city and the people were explained about the importance of ‘EYE DONATION. It was indeed evident that very few people were actually aware about eye donation and the desperate need for Corneal Transplants in this country. These kind of events have to be organized more often to make people aware about EYE DONATION. Aditya Jyot Institute of Optometry students contributed to the intercollege culturals of eight Institute of Optometry of the Western region at B.V.D.U. 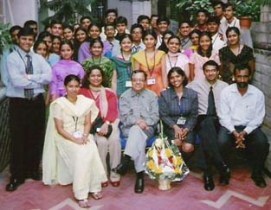 Medical College, Pune on 20th March 2005, to mark the occasion of the World Optometry Day.They won the Carl Zeiss sponsored second prize as well asSuag Optics sponsored third prize for the Garba dance and alsowon theSuag Optics Sponsored first prize & Carl Zeiss sponsored second prize for the Jogua dance.AJOI also got the fifth prize from Suag Optics for the solo song from "The Titanic". 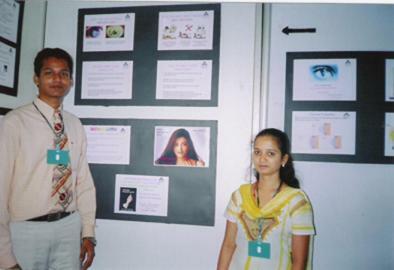 A.J.O.I students won the best prize for the poster on Eye Donation during the All India Optometric Conference of the Optometric Association of India, Kolkatta on 4th - 6th March 2005.Other poster topics presented by the students were on ARTIFICIAL RETINA, PREFERETINAL HYPERACUITY PERIMETER AND CONTACT LENS DEPOSITS. 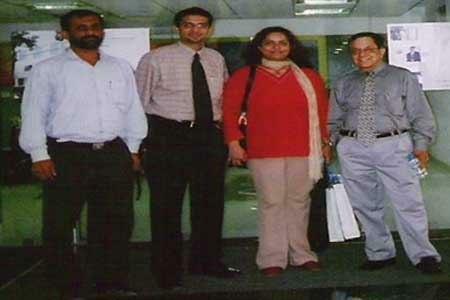 Dr.Satya Verma, President envoy of World Council of Optometry visit to Aditya Jyot Eye Hospital Pvt Ltd on 29th March 2005. From Right to Left Dr. Satya Verma , Faculty ( Prof .Sujay Dangi and Dr.Kishore Bhandary). 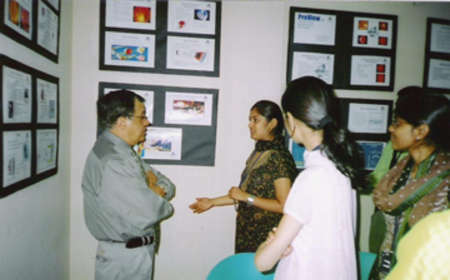 Ajoi Student explaining on the posters made on Artificial retina to Dr. Satya Verma. Chairman and Medical Director, Dr. S.Natarajan log on to www.drsnatarajan.com .